What do you look for as you homeschool? Motivation? A little encouragement? Perhaps a unit study? Maybe an art activity? Possibly Scriptural relevance for your day? Perchance even a giggle or two? How about information on great products? Have you longed for sincerity? Another viewpoint could be good; maybe even some honesty about the tough days? We know—we have them too! Homeschoolers come together in a community called TOS, and we are so much more than pages in a magazine! Join us and have all these things and more! Within each issue you’ll find amazing resources, candid interviews with business owners, glimpses into the routines of other homeschools, articles from the experts in homeschooling, as well as up-and-coming innovators helping our days run a little more smoothly. Find them all in our pages along with their insight, expertise, and honesty as we all homeschool together! Educational experience, edification, and excitement are available for you. The Winter 2009-2010 Issue contains everything you look for in a quality magazine. 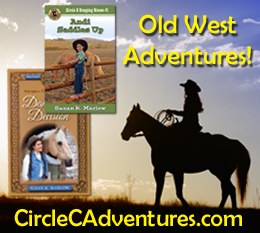 More than 200 glossy, full-color pages packed with articles, useful resources (including a unit study and art activity), informative advertising, and plenty of welcome sharing from homeschoolers much like you! What sort of information will you benefit from in the Winter 2009-2010 Issue of TOS? Learn more about David Bill, a British artist whose illustrations have been commissioned by the BBC and others. He’s also a homeschooling dad with a clear vision for his family. Can you spot the six errors in this italicized sentence: I laid on the bed, wondering if alot of the guests would even recognize John and I, especially since we had been gone for three year’s. If you can’t find the errors, you need to read this article by Ruth Beechick! How can you help your reluctant writer? Danielle Olander offers simple, proven advice and techniques. Learn why Teaching Writing: Structure and Style has been so successful as a tool to teach students how to become excellent, confident writers. “In fourteen hundred and ninety-two . . .” Can you complete that sentence? If so, you’re proof that rhyming works as a tool for remembering facts! In this lively article, Carol Barnier delights us with her enthusiasm for writing “ditties” that help us recall essential facts and dates. Find out how the Barnier family “starts each day the rhyming way”! Read all of this information and so much more! Several articles about homeschooling the preschooler are included, as well as a few on homeschool support groups, writing, and even a transparent look at other families in the midst of the journey we call homeschooling. 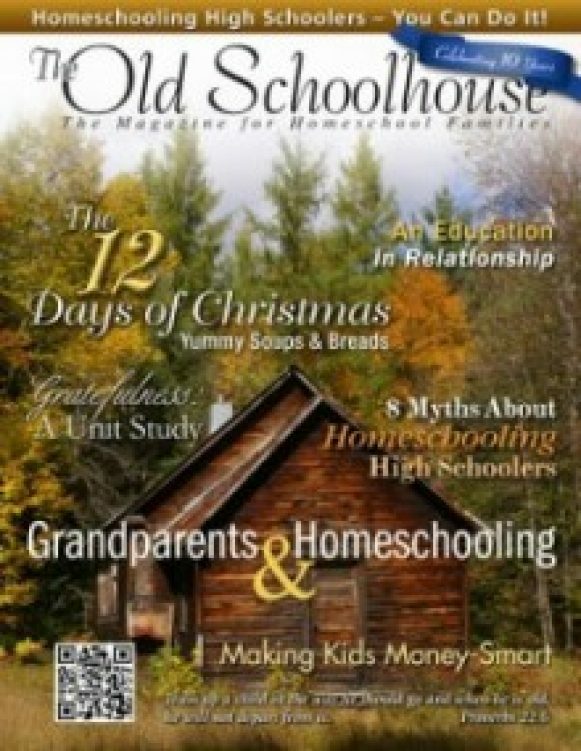 This issue of The Old Schoolhouse® Magazine will excite you as it provides encouragement for the everyday activities in your life as a homeschooling family. How about checking out some numbers? We bring you numbers about homeschooling, and a few about household mixes to help at home! Even some help to take care of you and your family are found in the pages of this issue. Tina Rice writes about our cover school in this issue, the Milton District School. And 2009 could not come to a close without “A Tribute to Christopher J. Klicka”. 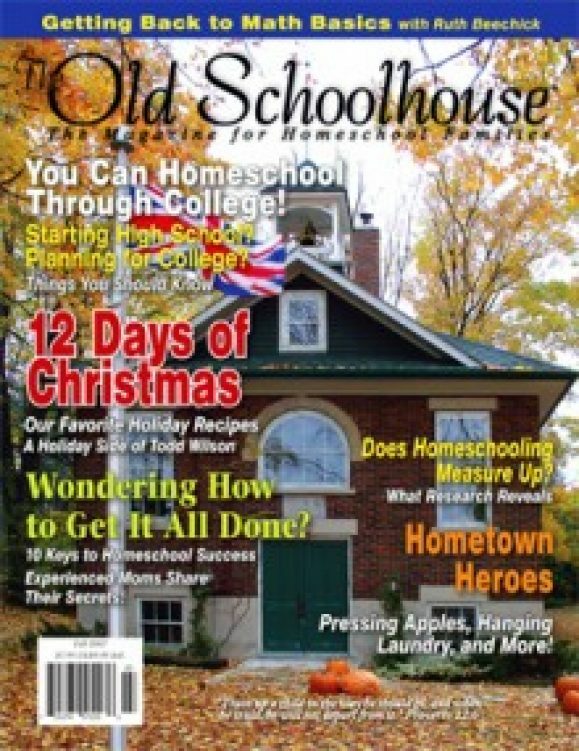 Read it all as you find pleasure, leisure, encouragement, and help for home, school, and more in the Winter 2009-2010 Issue of The Old Schoolhouse® Magazine! You won’t want to miss the spring 2009 issue! Do you ever need a little help getting organized? Homeschooling families face an extra organization challenge. Where do we store the books, hands-on materials, and miscellaneous supplies? Our spring issue is packed with ideas. There are even tips for organizing your high school student! Five ways to get your high school student organized! 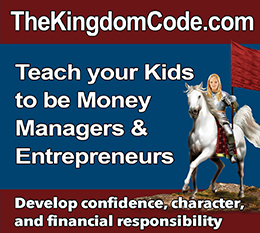 Who has the responsibility to teach and train our children? Pat Marcum shares his insights. The 2008 Excellence in Education Award winners are in! A grandmother reveals her highest calling—homeschooling. Amanda Bennett shares a garden unit study. Ed Dunlop shares how to defend our children’s hearts, as well as our own. Storage solutions for your already-crowded home! A granddaughter is learning a way to treasure her past for the future by journaling. Todd Wilson shares one man’s perspective about clutter and home organization. You CAN conquer those mountains of clutter and confusion! Discover Arizona! A state that has something for everyone. Taming chaos in your family—from math to daily chores. Learn how to make beautiful music together as a family. Viral marketing? Focus groups? Meet the Homeschool Crew! Discover how congregations and homeschooling families can work together. Learn how one family was drawn to “unschooling” and how they are loving it! Tips about how to travel at the right time, in the right way, and for the right price. Learn how to feast on a budget while traveling. Meet the “father of microbiology”. Save time, gasoline, and money with a well-stocked pantry. This is just a sample of the wonderful articles waiting for you. Do those questions sound familiar? 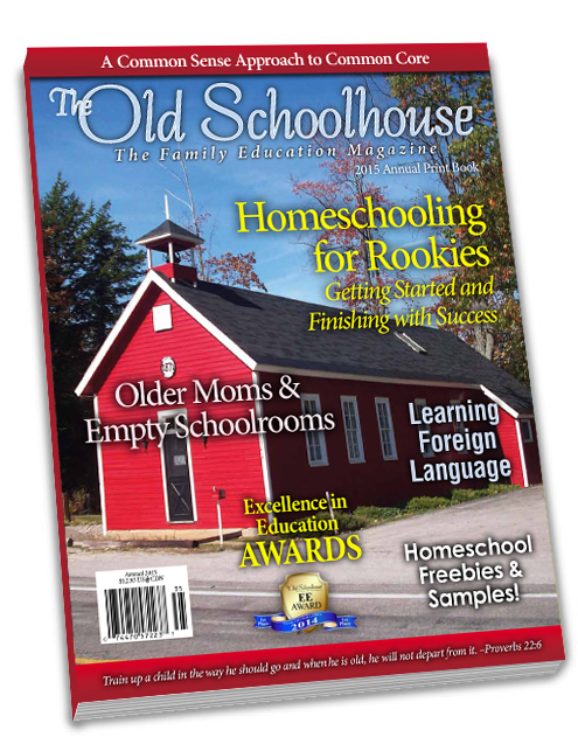 Whether you’re the one homeschooling and fielding those questions or you’re just thinking about homeschooling and asking those questions, now is a great time to subscribe to The Old Schoolhouse® Magazine. You’ll love the biblical encouragement that will help keep you going strong in your commitment to your family and the Lord. You won’t want to miss the summer 2009 issue! 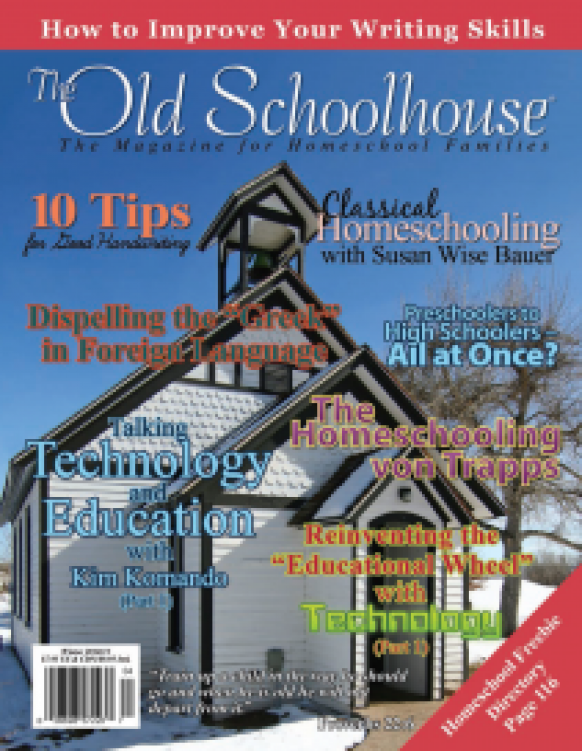 Packed with fabulous articles and resources that will encourage and equip you to homeschool with excellence, the summer 2009 issue is a must-have. Do you ever need a little help getting organized? Homeschooling families face an extra organization challenge. Where do we store the books, hands-on materials, and miscellaneous supplies? Our summer issue is packed with ideas. There are even tips for organizing your high school student! Our Summer 2009 issue shares the article, “The Eye of a Naturalist,” with information about photography, as well as “The Gift of Art Journaling,” appropriate for both parents and children. Get excited about God’s creation, and get out and investigate it! Charlotte Mason’s philosophy is an incredibly popular method of homeschooling. Findencouragement for continuing in this method—or an education for yourself—as you curl up with articles in this issue discussing everything Charlotte Mason! Enjoy encouragement from seven different experienced homeschoolers in a single article, and find even more throughout the pages of The Old Schoolhouse® Magazine. Words from Zan Tyler of Apologia, The Familyman—Todd Wilson, Jane Claire Lambert of Five in A Row, renowned Ruth Beechick, Whole Heart Ministries’ own Sally Clarkson, and more. Be reminded on every page thatyou are not alone! The disruption caused by the mess of remodeling in a home with ten family members—gain insight and advice with basic tips on how to prayerfully make it through successfully. Faith from a child’s point of view—complete with sincerity and practical life advice from the Word of God. Public-school-assisted homeschooling—it attempts to draw families in for support services, but a disappointed family soon found their authority shrugged off by their local school administration. Honest frustration, from dragging out of bed in the morning in dreariness to the comforting success of homeschooling a daughter amidst the warmth of a candlelit living room—mothers open their hearts to you as a homeschooling community. Comparing the homeschool work of our children—as the temptation to compare what our children are doing to others gets the best of us at times, relish this good advice aboutstaying focused and praying for the plans of your homeschool. The “right” way to homeschool—the struggle to find balance between sticking stringently to a scope and sequence and living a learning lifestyle is revealed in the day-to-day events of a homeschool that may be much like yours! Laugh out loud as upcoming issues share “Laughable Lines” from fellow homeschoolers. We know there will be others with quotes similar to those shared by the Wuehler family. In our hectic days, sometimes a child using a lizard’s tail to pick his nose or finding someone washing toes in a bowl of milk—because they are dirty—somehow becomes par for the course! 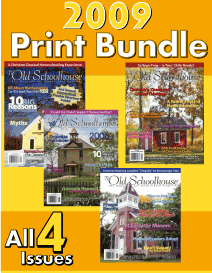 Enjoy your days and laugh out loud with The Old Schoolhouse® Magazine! We complete the magazine with “Product Reviews” in the final pages, enabling you to be better informed when choosing homeschooling products. Read more about The Light Across the River by Stephanie Reed, the historical fiction sequel to Across the Wide River. Learn about using Sing Science Audio CDs or a DVD about the Great Awakening and other resources for your homeschool. Find even more reviews on our Web site! There are few places you can go to find the kind of information, support, and encouragement that you’ll discover inside of TOS—approximately 200 pages worth! 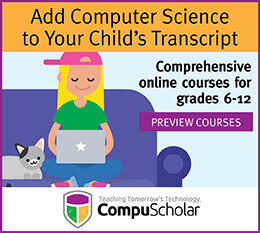 Learn how to homeschool with excellence . 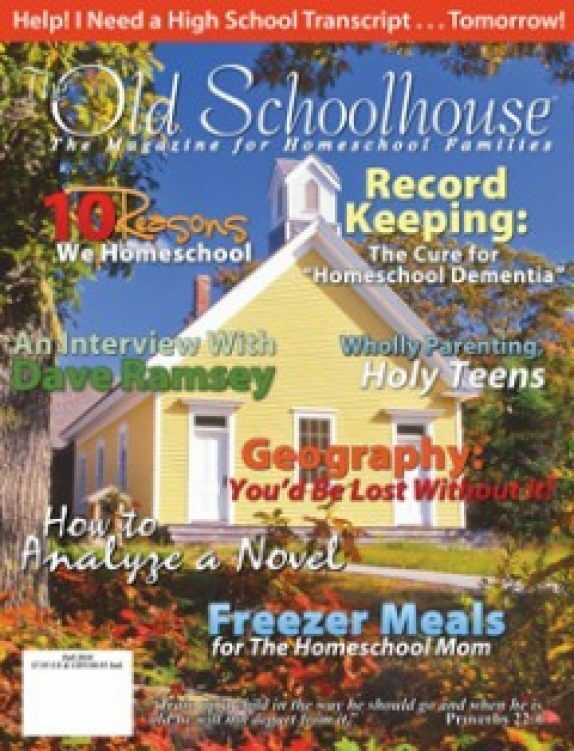 . .
As you reach for new school supplies and curriculum in anticipation of beginning a new school year, reach for homeschooling inspiration found in the Fall 2009 Issue! 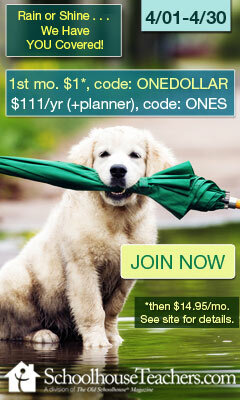 Fill your back-to-school time with the best of back-to-HOMESCHOOL information. And you’ll love the Biblical encouragement that will help keep you going strong in your commitment to your family and the Lord. Want to be informed on current issues and educational opportunities? Learn from homeschooling experts? Are you looking for practical “how-to” information you can begin to implement in your homeschool right away? Explore exciting learning adventures with your children, including some explosive chemistry experiments kids love! Help prepare your students for college or show your youngsters how to get started with their first entrepreneurial endeavor! Enjoy a special interview with homeschool supporter and singer/songwriter Twila Paris! Do you know someone who would be interested in earning a law degree from home? 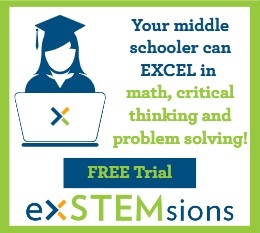 Need help teaching writing, math, or science skills? Want to be inspired by families similar to yours, sharing their hearts with what works for them? Need help to stay the course and enjoy the real blessings you know homeschooling can offer you? We Love Homeschoolers! Prominent Colleges Jump on the Recruiting Bandwagon by Claire Novak. Earn a Legitimate Law Degree—From Home?! by Donna Rees. What Is Critical Thinking, and How Do We Teach It to Our Children? by Rebekah Wilson. The Ps and Qs of High School Portfolios by Malia Russell. Report Cards—Who Needs Them? by Inge P. Cannon. Third Grade? Time to Think About Calculus by Norman M. Birkett—Really? Find out what course is THE gateway to many of the best jobs in our high-tech world! Kids and Business: Lemonade Stands to Nanotubes—Amanda Bennett gives us tips and resource ideas to help the young entrepreneurs among us. Encouraging Entrepreneurship by Tiffany Silverberg. Walk Into a Big World of New Opportunities: Teaching English as a Second Language (TESL) by Brad Voeller. Essay Writing Made Easy—Language arts specialist, Ruth Beechick, will help you understand the skill and process of writing that all-important essay. Discover what other homeschooling families do with their days—While the Stoltz family plans high school classes, the Allen family is busy raising goats and learning every day in a hands-on environment that makes difficult concepts more understandable and fun! The 12 Days of Christmas by TOS staff members—Are you looking for some simple, frugal, delightful ideas for Christmas gifts this year? Twelve TOS staff members explain how to make some of their favorite homemade gifts—brooches, wreaths, candles, trinket boxes, cotton dishcloths, aprons, heat paks, and more! Diet Coke and Mentos: What’s Really Going On? by Dr. Jay L. Wile. The Benefits of Studying Chemistry by David M. Jones. Checkmate . . . An exceptional example of the amazingly designed human brain by Dr. Carl Wieland. Is it really possible for a man to play six to twelve chess games—simultaneously—and blindfolded—and win them all—every time? Ten Reasons We Homeschool—Top Ten Reasons by Camille Kendall. Chapel: He Is With Me—Does God really care about our hurts and needs? Learn how God sustained LaShonna through sickness, her father’s death, and her unborn child’s death. Homeschool Watch Public Schools—Education or Indoctrination? by Pat Marcum. Should Homeschooled Teens Join Church Youth Groups by Meredith Curtis. Oral Presentation by Jennifer Loucks. The Family That Stays Together by Andrea Newitt. Family Youth Night by Nancy Tilford. Town Square Homeschooling: Growing and Thriving in the 21st Century by Amelia Harper. Laugh out loud as upcoming issues share Laughable Lines from fellow homeschoolers. From Our Family to Yours: From a child starting high school to one who is graduating, are we ever really ready? Editorial: Marital Bliss . . . Sometimes by Deborah Wuehler—Is there such a thing as marital bliss? Well, sometimes. Find out here what makes a marriage glorious. When We Are Called to Silence by JoJo Tabares—What can the sound of silence contribute to your effective communication? Plenty! Teachers’ Lounge: What if your high school student wants to go to public school? Little Artists: Owls by Carolyn Hurst. A fun study and drawing lesson for the younger ones! Food Preservation, Food Storage, and Eating From the Pantry . . . Oh My! by Lisa Barthuly. The Scoop on Poop by Dr. Heather W. Allen. Tutoring Center—How to Begin Homeschooling. Homeschool Lab—We complete the magazine with “Product Reviews” in the final pages, enabling you to be better informed when choosing homeschooling products. You’ll never want to miss an issue! Don’t let the winter blues or post-holiday slump get you down! 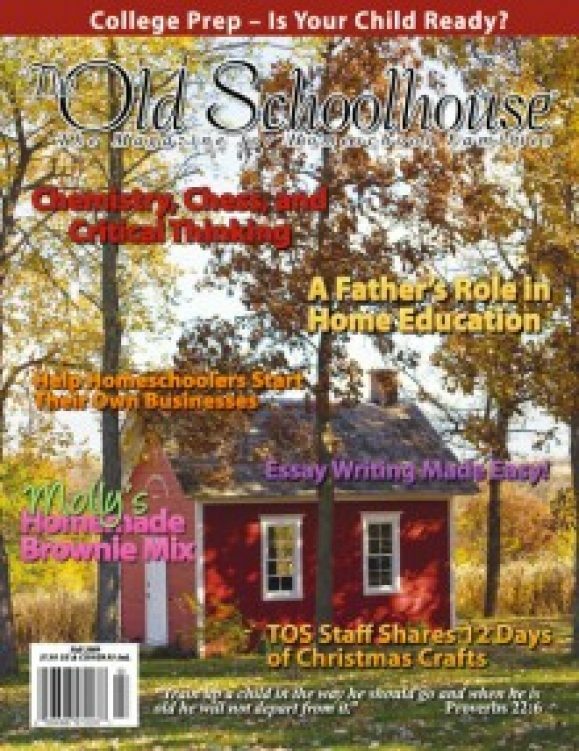 The Winter 2010-11 issue of The Old Schoolhouse® Magazine is packed with articles that will cheer, encourage, and inspire you. Re-energize your home and homeschool today!